Pablo Neruda (1904-1973) remains one of the best-known South American poets of the 20th century, with copies of his most famous books selling in the millions, and two biographies published about him. His life is the stuff of legend. Born in a rural town in Chile, he began writing poetry as a child of 13, assuming the pen name Pablo Neruda because his family vehemently objected to his writing poetry. He achieved celebrity at 20 with his wildly successful book of love poems, Veinte Poemas de Amor y Una Canción Desesperada (published in English as Twenty Love Poems and a Song of Despair). Following his literary success, he was sent on a number of honorary consulships to countries around South America and the Far East. Later in his twenties he became involved with the Chilean Communist party, and in 1948 became a political fugitive, escaping to Argentina through a mountain pass. In 1971 he won the Nobel Prize, and died two years later; some claim that he was assassinated by the doctors treating him for cancer in a Chilean hospital. Neruda’s poetry underwent a radical transformation as he became more and more involved in politics, and it is this shift that his critics and biographers highlight when examining the arc of his work. His best known collection is a book of surrealist poetry published in three parts, Residencia en la tierra (1933) (translated in English as Residence on Earth). But Neruda published a book in between the smashing success of Twenty Love Poems and the literary breakthrough of Residence on Earth, which has remained obscure until this day. 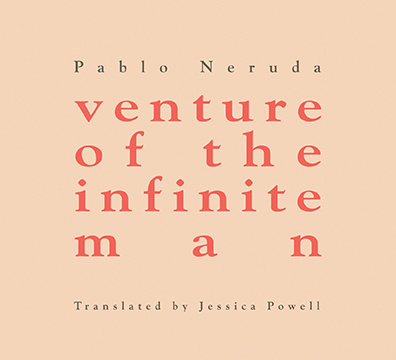 This book is tentativa del hombre infinito, published for the first time in English in 2017, and translated by Jessica Powell, as venture of the infinite man. At the time of its publication in 1926, venture of the infinite man (whose title is deliberately left in lowercase, as the book eschews capitalization and other grammatical and literary conventions in the book) was not well received. In an interview, Jessica Powell, the translator of this first English edition, explains the lukewarm reviews: “Readers who were expecting more of what they had adored about the love poems found this experimental, semi-surrealist style disorienting and even incomprehensible. Even critics at the time weren’t sure what to do with it.” The book, comprised of 15 interrelated cantos which can arguably be read as one long poem (the volume is subtitled “a poem by Pablo Neruda”) narrates “the dream-like nocturnal voyage of a young, melancholic man on an epic quest through time and space to rediscover and redefine his voice and himself,” according to Powell. The significance of this work as the scaffolding upon which he later built the surrealist style of Residence on Earth is in large part what led to the publication of venture in this bilingual edition. the more I worked with the fifteen cantos that, together, make up venture of the infinite man, the more it became clear to me that the work absolutely does have an internal narrative, a cohesiveness, and it’s [sic] own logic, but it’s one that must be felt through rather than reasoned with, much like a dream or an intuition, or love. This meant that, at times, I had to sort of half close my eyes and allow words and images and meaning to float to the surface. The translator approaches this work with an absolute willingness to give herself over to its strangeness, and a determination to allow Neruda’s emerging voice to speak for itself. Part of the goal of this publication, according to Mark Eisner’s introduction, is to provide access to Neruda’s work in the form in which he intended it to be read – which is visually striking in its use of space on the page, as well as confusing. Neruda intentionally kept errata and left out page numbers, punctuation, and other visual markers that help guide readers through a text. Later editions opted to correct these “flaws” and make the text more accessible to readers. There is some logic to the decision, as Neruda was largely known as an accessible poet. In his review of Mark Eisner’s biography of Neruda, Troy Jollimore writes: “Moved at an early age by the exploitation of the disadvantaged, he viewed poetry as existing for the benefit of the common people. ‘Poetry is like bread,’ he famously wrote. ‘It should be shared by all, by scholars and by peasants, by all our vast, incredible, extraordinary family of humanity.’” However, this perception glosses over the moment in time captured in venture, a chrysalis of creative energy that propelled Neruda forward in his life and his art. Powell performs acrobatic feats in preserving the strangeness of the text, while also capturing the physical energy that courses through the poem. She dances between internal rhymes and alliteration to convey the sense of each canto, as in the line: “without meaning to i let loose the canto the exaltation of the night / the wind blew past whipping my back happy emerging from its egg.” The repeating long sounds of “past,” “back” and “happy” convey the energy of the repeating sounds in Spanish that carry on throughout the book. The resulting text glides through oceans, dreamscapes and nightscapes — but only for the readers willing to close their eyes and jump, free falling through Neruda’s alternate consciousness as Powell herself has done. Neruda, Pablo. Venture of the Infinite Man. Tr. Jessica Powell. San Francisco, CA: City Lights Publishers, 2017.